There will be no week #13 stats as I am almost positive that I have self-destructed to the point of gaining weight for the first time this year. At least, I think I've gained weight, but every time I think that I end up losing half a percentage point of body fat or something. The switch away from regular pop must have really been the most significant thing I've ever done, since I'm not even trying and I'm still living at or below my body's energy needs. And what are those needs? According to The Running Program, my height and weight requires almost 3000 calories to break even every day. Good gravy, 3000? No wonder I'm floating downward: I cut out 5 cans of pop a day, so there's 750 calories right there. For years I used to quote Dennis Leary’s routine where he said he would continue to smoke because it didn’t matter how you treated your body because you’d end up like Jim Fixx. As I wrote eariler, Jim Fixx was an avid running enthusiast who suddenly dropped dead while running in his early 50’s. I, too, found this incredibly funny and used his situation as a reason to not run, along with other scary running stories (such as a girl who was so addicted to the endorphin “high” you get while running that she ignored the pain of her shin splints and caused permanent damage, etc.). Lo and behold, some basic research turns up Jim Fixx’s autopsy, which indicates that he neglected his cholesterol which caused 95% blockage of one artery, 85% of another, and 50% of a third, eventually causing a massive heart attack. So it wasn’t really running that killed him; it was the lack of importance he put on regular cholesterol checkup and maintenance, coupled with a poor family history (a heart attack killed his father at age 42). So, if anything, Fixx’s running history probably extended his life a few years. Even though I haven’t lost any significant weight in the last month, I am still pleased with my results — I have obviously made enough significant changes to my lifestyle that I am now living within my body’s means. I drink diet pop (which is tolerable, but I’ll never truly enjoy it), so that’s 750 calories a day less, which must have been a significant portion of my old lifestyle… I also actively choose vegetables over other side dishes, and Melissa has been great about making chicken w/ vegetables a lot for dinner which is also helping. So, I’m not in danger of gaining weight for the rest of my life… now I just need to get down to where I want to be. Demonlord, for those not familiar with his work, is the hardest-working oldskool cracker still at it today. Nowadays we have windows executables with symbol information still linked to them — this is child’s play. Way back when, we had 512-byte boot loaders that we had to disassemble by hand. Demonlord still does this, and is the best cracker I know both two decades ago and today. He’s so good that most cracks take him less than an hour, and unlike most hack jobs, they’re quite elegant and graceful. For example, check The Running Program: His crack never even touched the .exe — instead it loads an INT 13 handler that intercepts the request and redirects it to the data saved off of the protected track. You know how there’s one person responsible for about 95% of all the ATARI 2600 cartridge ROM dumps out there? Demonlord is responsible for cracking 95% of all the bootable PC diskette images out there. The next time you play a bootable PC game in an emulator, say a little howdy for Demonlord. So now I don’t know if it’s the stress or the switch to diet pop that made me trickle downwards. Not complaining, I guess. Since I love to goof off with my IBM PC/XT, and since I want to start running again, I won an auction for MECA’s 1984 software “The Running Program”. 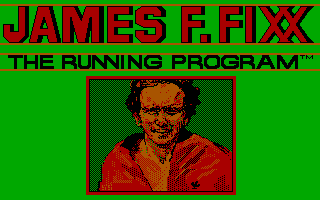 The Running Program was based on Jim Fixx’s The Complete Book Of Running from 1978, and it contains stretching exercises, evaulates your fitness level, records and graphs achievements, etc. It’s also fairly well copy-protected; every single track is goofy, and the program requires information loaded from one of the goofy sectors. Not difficult, but time-consuming. When I finally get it cracked, I’ll make it available. Jim Fixx is dead, MECA is long gone, and I have little scruples when it comes to 22-year-old software. Oi. Things aren’t going to get any better for me until I finish something for MobyGames that I’ve been putting off.